We understand that many people are watching the bottom line and keeping close eyes on a budget. 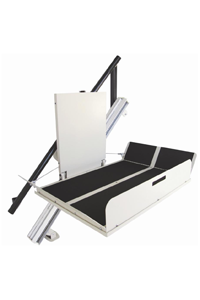 We also know how the installation of a residential stair lift could improve the home life of people who are dealing with limited mobility and are also on a strict budget. If you are considering the purchase of a stair lift, it’s important to know that monthly financing options are available. A fixed interest rate loan will allow you to always know the amount of your monthly payment. Some payment plans with a fixed interest rate loan feature monthly payments starting at $89 per month. Monthly payments may be higher, depending on other factors. Please call your local office for details and options. It’s also important to review all loan terms, final amount financed and APR. Review all loan terms with a store associate before accepting any final loan terms. Indy Stair Lifts is committed to answering your questions and helping you make the best choice for yourself and your home. A residential stair lift means a return to freedom in the home. It means not allowing mobility limitations dictate how you live your life and enjoy your home. Installing a stair lift to your home makes your home more accessible. There are stair lifts designed for outdoor use and stair lifts designed to work with curved stairways. There are stair lifts that can work with the narrow stair lifts often found in older homes. The key is finding the right stair lift for your home.